Since my husband lives in NY because of his employment, and I live in NC with our son, we plan on taking a vacation so we can be a “family” again. Plan to pay down some credit card debt. It’ll be nice to not have to worry about that!!! I plan to take my wife on a mediterranian cruise, 9 nights, in a private balcony staterroom, cruising the world thanking TurboTax for increasing my refund and help me qualify for more. Thank you for asking, I appreciate your caring. I will use the tax refund to invest back into my upstart business. My vision and I take action on it everyday is to create profitable income for local business owners. Helping them to grasp, understand and utilize online and social media marketing so we are both creating new jobs for our country and economy. Going to SXSW will allow me to continue the process I started of building relationships with leading minds from all over the world. To meet and partner with some of the community I have interview on the radio show would be an awesome step to grow and have a powerful effect for all involved…participants at SXSW, presenters SXSW and Me! I would go to the casino and put it all on Black and hope for the best. Or pay off debt, but that is too easy…. Will put our refund toward remodeling our living room. Our tax refund is going to sending my 12 year old and husband to Dallas for the World Championship for Vex Robotics. He and his team won an excellence award for design, programming, and community service! I’m so proud of him. We are looking for sponsors, but if they are going no matter what! In this case it’s a once in a lifetime event versus my typical answer-debt repayment. I would LOVE , LOVE , LOOOOOOOVE to attend SxSw. It would be huge for me personally and professionally. I’m in the same boat as James T. I started a web development company about a year ago with my wife, and we’ve put everything we have into it. Any refund we get (not expecting it this year) will go right back into the business. Going to SXSW Interactive would be a huge boost for our networking, marketing, and sales. It would help us make a splash in a very large, loose-knit community. Our goal is to be able to expand the business over the next couple years and help out the local community by putting people to work. We figure that the great thing about starting a business during these tough times is there’s nowhere to go but up, as long as you can weather through it. Thanks TurboTax for offering great services to individuals and small businesses, and thank you for making this opportunity available. Hopefully a trip to Austin! I’m a web designer and have dreamt of being able to go to SXSW for some time and learn about all the latest that’s going on in the industry. I run my own business and it’s really small, and i’d love to be able to network and market my services to others in the industry and collaborate with other firms on projects. Thanks! My fiance and I are getting married in May and don’t have money leftover for the honeymoon. We hope that we’ll get enough back to put towards a weekend getaway so we’ll have something to look back on fondly someday. I’m putting our tax refund in our kids’ college savings accounts. With the way education costs keep rising, they’re going to need every cent they can get. We need a new roof and as New Jersey and the USA are offering tax incentives to go solar we can install solar panels on the south sloping side of our roof. This years refund will enable us to buy the solar panels and we’ll then be able to deduct 30% of the cost off next years Federal income tax and $1.75 per watt installed up to 10,000 watts from our NJ State income taxes. Will be socking away our refund for our kids’ college fund… and maybe use a little to take the kids to SXSW too and sightsee around Austin. Never been and would love to go. Thanks TT! Considering it’s only money I would spend half of it on something I would enjoy, like a trip to Italy. The other half would be on the back burner till I got back. Remember people you can’t take it with you when you die so make it worth something. Thanks for participating. You’re our winner! I just sent you an email to gather more info. I would use a big refund to pay off my last credit card, then I’d pay to send my son back to college. Then, I’d adjust my W-4 so my refund wasn’t so big next year and invest the difference. Let’s not give the government an interest-free loan, eh. i’m going to use my refund on plane tickets to visit my dad. we haven’t seen each other in almost 3 years. pay down debt and the rest in savings! My tax refund is going into my Vanguard Star Fund!! It’s sad but true – Nick can’t go to SXSW. SO, you’re our new randomly chosen winner. You have to get back to me by Tuesday though so we can get you your two SXSW tickets; I’ll email you in a few. Well since I was just $50 off the average for 2009, I can tell you what I DID already do with my refund…I put the whole amount into my Roth IRA – I’ll let you know what how much it turns into in 42 years when I need it! Although lots of people have structured places to spend their tax refunds — after losing three of my best friends to cancer in the past 2 years to cancer — they were all my age — I want to spend the money to enjoy an experience — would plan a trip to return to Italy in September and visit Sicily and the Amalfi coast. I would catch up my bills from being laid off, put a little in savings and do something nice for my kids , like a special dinner. Save it up and let it grow! I will pay off some debts with the good reFund Turbo Tax got for me and some the rest for the bad economic future! I’m going to buy $700 worth of insulation material to combat the nightly noise from my noisy downstairs landlord neighbors. Yeah! I’d donate it to a charity. With a 25% marginal federal, and a 5% marginal state rate, The charity would get $2,753, and I would get $825 in tax savings. That’s an immediate $3,578. The $825 I would put in a Roth account. Payin off my car is what I am doin with my big refund! Yea turbotax.com for getting me a big refund! My goal? Livin debt free! I would use my refund to help start up my personal chef business by buying lots of new kitchen equipment! We just purchased a house and are getting ready to start renovating! Our tax refund is going toward new countertops and hardwood floors! I would spend my tax refund expanding my newly formed business into new avenues and purchasing equipment that will allow us to perform our services at a higher quality. If I get anything back, I’d like to pay down my credit card debt and invest any remaining funds into my small business. Murphy’s Law will dictate. Every year an unexpected expense rears its ugly head right about the time we receive our refund. If we get lucky, we’ll save some and take a family vacation. 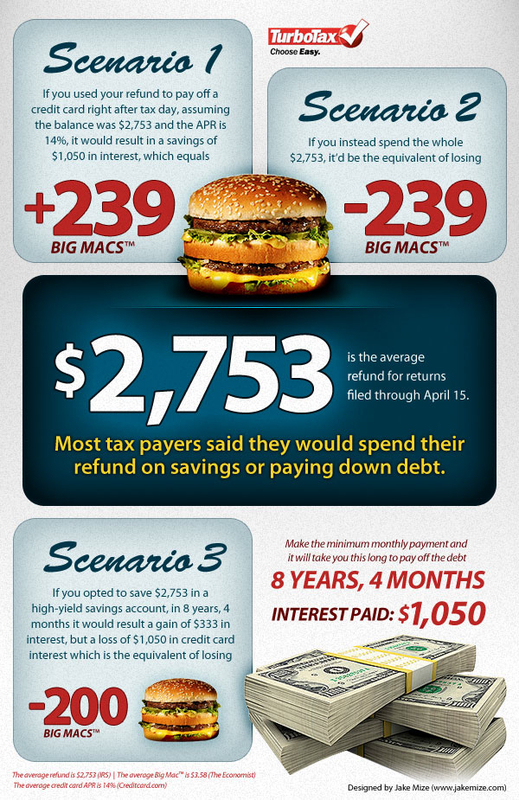 Some to pay off debt, some to put down on a car (making new debt, ouch), and a little to spend…but definitely not on Big Macs! The answer is quite simple, really. I will have to avoid temptation of running off and buying some new gadgets with my check and put the money to good use and pay some of my student loans. My education was the biggest ticket item I’ve ever purchased and it is the one I value most. It can’t get repossessed, but it is what’s allowed me to me to have taxable income. Being ahead on these payments makes sense in the long run since it is less interest that I will pay, and it will help in the event that I lose my main source of income. So for all parties involved, Uncle Sam, my alma mater, the bank and myself, this is always pure win. Although meager this year, my tax refund went to help cushion myself should I need to fall back on it in the future. Life always throws unexpected things your way! It’s a good idea to be ready for those curve balls. Firstly, Turbo Tax is amazing. Secondly, I just started a small business. We’re a small web garage start-up. I already cashed out my IRA and put am putting everything else on the line to try and change the world. If, hypothetically, I received a big refund it would go straight towards the business. SXSW would be a dream come true. It’s highly relevant and the connections and networking alone would be worth their weight in gold, not to say anything for all the panels and sessions. Needless to say, I’d give you all inappropriately long hugs if I got the tix. Thanks again Turbo Tax. You guys rock! I already used part of my tax refund to get out of debt. Now it’s just a matter of saving the rest – I want to go back to school, and eventually have enough savings for a house. This solves so many problems while improving the value of the house: driveway needs to be replaced, water is pooling around the yard, watering the lawn is expensive, I hate street noise, I want a nice(r) patio in my yard. Wow, I might need a bigger refund! Paying off debt related to home remodeling! Thank goodness for a certain homebuyers’ credit. It might actually take care of most of it. I would probably use my tax refund to funnel into projects I’ve been wanting to do but haven’t had the spare funds to get off the ground.